Extend your adventure outside of Yellowstone’s boundaries. Hey, it’s Kasey Austin, bringing you some expert tips on my favorite national park on this planet: Yellowstone! While Yellowstone’s wonders (Old Faithful, Yellowstone Lake, Grand Prismatic Spring, Grand Canyon, Mammoth Hot Springs, etc.) are AMAZING, I actually want to talk about what’s outside our world’s first national park that makes it so special. There is so much more to Yellowstone than what lies inside the boundaries of this 2.2 million acre wilderness! Yellowstone is part of something called the Greater Yellowstone Ecosystem, an approximately 22 million-acre expanse of land encompassing two national parks, state lands, portions of five national forests, three national wildlife refuges, Bureau of Land Management holdings, and private and tribal lands. With all this land to explore, it’s no wonder that most tourists stick to what’s inside Yellowstone’s boundaries. Yellowstone National Park has five entrances (north, south, east, west and northeast) and here, I want to give you some options of how to explore beyond Yellowstone National Park. Just outside of Yellowstone’s West Entrance, you’ll find the touristy, hokey town of West Yellowstone (I say this in the most loving way possible). Truthfully, I actually do love West Yellowstone and its countless tourist attractions—the Grizzly and Wolf Discovery Center is worth a stop in and of itself—but moving past West Yellowstone opens up a variety of options for the activity enthusiast. I’d recommend a trip up north on Highway 191 toward Bozeman, Montana, through the Gallatin Canyon. Along the way, you’ll find one of my favorite accommodations, the 320 Guest Ranch, which we stay at for two nights on our Montana Adventure. Here you can experience ranch living at its finest with one-of-a-kind horseback riding opportunities, fly fishing in the stocked pond on the property, and a juicy Montana steak dinner by night. Just beyond 320 Guest Ranch is the outdoor lover’s paradise of Big Sky. A ski resort in the winter, Big Sky Resort has a host of things to do in the summer including tram rides to its 11,000+ ft peak, hiking, zip lining, mountain biking, and golfing. Just down below, in Gallatin Canyon, check out our favorite local rafting company, Montana Whitewater for rafting the Gallatin River or tubing the Madison River. Or head all the way to Bozeman (2 hours from West Yellowstone) to experience life in this cool, outdoorsy college town with a wide range of great eats, local bars and shopping opportunities. Immediately outside the original entrance to Yellowstone National Park, you’ll find the tiny town of Gardiner. With no whitewater rafting opportunities available inside the park, the town of Gardiner capitalizes on its location by offering whitewater rafting trips on the Yellowstone River. A half-day trip beginning in town gives the family a fun, splashy 8 mile paddle through class II and III rapids and fantastic scenery. If you continue north toward Livingston on Highway 89, you’ll quickly end up driving through aptly named Paradise Valley. On our Yellowstone Family Vacation, you’ll horseback ride high up into the Absaroka Mountains alongside fourth-generation Montana ranchers to viewpoints overlooking all of Paradise Valley and the Gallatin Mountain Range (you’re just not going to find an experience like that inside the park!) By night, you’ll want to end up at Chico Hot Springs Resort. Tucked into the foothills of the Absaroka Mountains, Chico’s hot spring-fed pools let you soak in the midst of one of the most “Montana” landscapes imaginable. Make it a point to eat in Chico’s restaurant, one of the best restaurants in all of Montana. Be sure to order the famous flaming orange for dessert! You’ll have to drive about an hour beyond Yellowstone’s East Entrance through the breathtakingly beautiful Shoshone National Forest to reach one of my favorite western towns: Cody, Wyoming. Cody has retained its small town, western feel over the years and hosts attractions like a charming, walkable downtown, a nightly, high-energy rodeo, and the fascinating Buffalo Bill Center of the West. Just like any other town outside of Yellowstone, Cody offers the gamut of outdoor activities: hiking, biking, rafting, zip lining, fishing, horseback riding, ATV tours, and the list goes on. You can even head to Cody Firearms Experience to try out shooting different types of guns dating back to the 18th century. Our Founder and President’s favorite spot is Monster Lake Ranch, about 8 miles outside of Cody and visited on our Western Adventure. This Wyoming ranch paradise hosts a variety of activities but the favorite is guided fly fishing for monster trout on Monster Lake, a true western experience! If you make it outside the Northeast Entrance of Yellowstone National Park, consider yourself one of the privileged few. The least explored entrance of Yellowstone is actually the most beautiful, at least in my humble opinion. About 3 miles from Yellowstone, you’ll come across the tiny town of Cooke City. Only about 100 brave souls live in this place year-round (it’s very isolated yet transforms into a snowmobiling Mecca come winter). One of my favorite things to do any time of year is go wolf-watching at sunrise in the Lamar Valley in Yellowstone and then head to Cooke City for a delicious homemade breakfast at the Prospector Hotel! Beyond Cooke City, you have two choices for the direction you want to go. You can either traverse the Chief Joseph Scenic Byway, a wondrous scenic route that will take you to Cody, WY. Or you can take my preferred route, the Beartooth Highway, a National Scenic Byway All-American Road which takes you up and over the 10,000 ft Beartooth Mountain Plateau and eventually down into Red Lodge, Montana – my all-time favorite mountain town. A trip over the Beartooth Highway takes at least two hours but I highly recommend taking a full day so you can stop to take short hikes, play in the snow and photograph all the amazing things you’ll see on your scenic drive. If you’re traveling from afar to visit Yellowstone, it’s almost a crime to not visit Grand Teton National Park, Yellowstone’s beautiful but not nearly as famous neighbor to the south. It does take nearly half a day to drive down to the Tetons but if you can spare a few days in your trip, it’s so worth it! Grand Teton National Park is famous for its gorgeous Teton Mountain Range, but the jewel-like lakes, abundant wildlife and lazy Snake River lulling its way through the park certainly don’t hurt its reputation either. Those seeking hiking and mountaineering opportunities will be in heaven exploring the Teton Range’s foothills and high peaks while watersport enthusiasts will love the opportunity to canoe Jenny Lake’s clear waters or float the Snake! 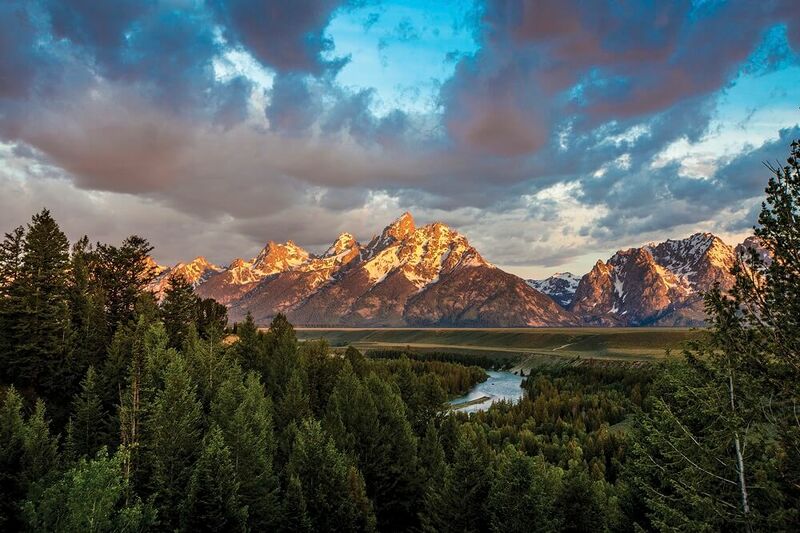 Further south, you’ll eventually come across the famous town of Jackson, Wyoming, where cowboy culture meets outdoor adventure and also where our Yellowstone & Grand Teton Adventure begins. Visiting the elk antler arches at the town square, grabbing a bite at one of the town’s many fabulous restaurants and sitting down for a cold one at the Million Dollar Cowboy Bar are high on anyone’s list of Jackson to-do’s! There you have it – a whole host of things to do just outside Yellowstone’s borders. Like I said, Yellowstone is a special place unlike any other on this earth that definitely deserves some time to explore, but there’s so much more to see and do when you discover the Greater Yellowstone Ecosystem beyond the national park boundaries!